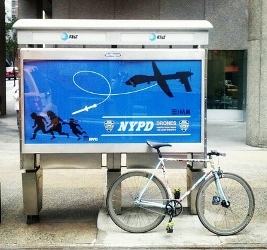 Political street artist Essam Attia, 30, was arrested last November for planting dozens of fake public service ads around Manhattan claiming that the New York Police Department (NYPD) used drones to spy on citizens. 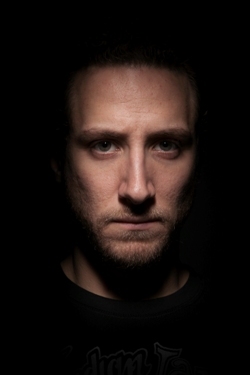 The pubic was quick to react, launching an online Free Essam campaign and a petition asking that all charges be dropped. We caught up with the artist, known simply as Essam, to talk about what led to his Big Brother campaign, the importance of artistic freedom, and why the arrest makes him think twice about creating controversial art. Where’d the idea for these fake ads come from? Well, the whole thing started in 2011 when the Gay City News ran a story of a Freedom of Information Act request they submitted that uncovered emails between the NYPD and the Federal Aviation Agency on the legality of using drone aircraft or UAV’s [unmanned aerial vehicles] over New York City. I was quite disillusioned by the media when no one picked up the story to create some sort of conversation on the matter. The issue was important enough that something be said. It took me some time to conceptualize, but I eventually came to the realization that cognitive dissonance is a powerful tool to create awareness, and in a country where most people live their lives without fear of oppression or tyranny, creating that sense in the observer is a very effective tool. Lucky for you that New Yorkers are pretty vocal when they uncover news like this. If New Yorkers are aware and don’t stand up to something, it likely won’t have traction elsewhere. What message were you trying to deliver? The message was twofold: through fear people had for the potential of drones being used in the skies above New York, awareness was created as to the reality of drone use overseas. All in all, the goal was to create a conversation about whether this is something people want in their lives. Essam placed dozens on posters like these throughout Manhattan. Where did you place your fake ads? The ads went up in basically every neighborhood south of 59th street. I was limited due to the type of ad space and the means of entry, but I’m not really at liberty to discuss details. The public seemed to embrace the work, at least in art, and civil liberty-minded communities. All I could really do was monitor a few online search terms to gauge the response. When did you realize you were in trouble? It got a lot of press coverage, but it was the attention the work garnered from the Daily News and the New York Post that let me know that authorities weren’t taking it very lightly. There are photos of the police dusting the phone booths for prints and the evidence collection team removing them with rubber gloves. You must have been scared. Did you expect this while you were creating the posters? Initially, I was frightened, but after more than two months passed, I assumed the police hadn’t placed much importance on it. I wasn’t trying very hard to remain anonymous so I figured if they had what they wanted they would have been at my door within days. When I eventually did get that knock on the door I was quite surprised. To be honest, no, I didn’t expect it at all. Essam’s ads led to his arrest. I’m sure it wasn’t hard. In two previous interviews, I had revealed that I was from Maine, and a former Geospatial Analyst in the US Army who had then gone on to art school in New York. How many of those do you think are out there? Part of the reason I was so candid is I never thought that the NYPD would put as much resource into arresting an artist as they did me. There are many other artists that work in a very similar—if not the same—manner who’ve never been arrested. Or who’ve only been arrested if caught in the act and then charged with far less serious crimes. What was their explanation for arresting you? It wasn’t until hours later when they decided to read me my Miranda rights that they gave an explanation, I finally got them to tell me I was being charged with criminal mischief, which after I asked to speak to an attorney somehow morphed into the litany I’m actually facing. What are all the charges you face? As for the offense, I’m being charged with grand larceny, criminal possession of stolen property, 56 counts of criminal possession of a forged instrument, and criminal possession of a firearm for my great grandfather’s antique revolver. How many of those charges stuck? Nothing is settled yet. My case is still in the criminal court proceedings. Do you think what they did is justified? I suppose that depends on your perspective. We live in a society that seems to be very easily spooked, and I’m sure people found it off putting and potentially threatening. I happen to believe that this sort of overreaction only perpetuates the very problems trying to be solved. Were you ever banned before? No, my work has never been banned before, though some of my photography has stirred the pot a bit in the past. What’s happened to the ads? 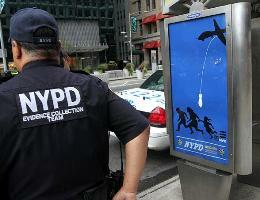 The ads were all taken down, and I would assume are mostly in the custody of the NYPD. I still have some, though most have been sold at this point. Do you think censoring art is ever justified? In short, no. Art is speech, and not only that, but art is a reflection on society through the eyes of its creator. Art shines new light and reveals perspective and art elevates consciousness. Without art we loss an incredibly valuable tool in analyzing the world in which we live and thus severely hinder our ability to shape a better future for ourselves our fellow man. I’m sure your legal bills are enormous. How are you paying for them? In March, Animal New York hosted a silent auction and concert fundraiser to finance my legal fees, which thankfully paid for much of the legal costs I was facing. And it’s not cheap. I’m honored to have found such great supporters and can’t thank those who helped me enough. Why is artistic freedom important? As far as I’m concerned, artistic freedom is as important as the freedom of speech. It is, after all, a form of speech as far as our legal system is concerned, and as per the founding principles of this nation, should be honored and respected by every citizen, especially the government. Artists make up an incredibly diverse and forward-thinking segment of society who generally view the world outside the box from which we’re taught to think. Albert Camus emphasized the role of the artist is equally important to society as that of government. The artist sheds new lights, provokes, and inspires, opens eyes and broadens minds. Without art, our way of seeing the world would change forever. How was NCAC involved in your case? NCAC put me in touch with the American Civil Liberties Union for a potential project in the future. Depending on the progress of my case, both organizations may become very helpful. Since my arrest, I spent a number of months planning the fundraiser. I’ve also worked with the online gallery 1xRun, fulfilled a number of speaking roles, and am continuing to make work, both photographically and graphically. Has the arrest affected your creative process? The arrest has certainly affected the manner in which I envision my work being seen. No longer is guerilla street art a viable option. Are you afraid to stir controversy now? I suppose that depends on the manner in which it’s done. I am certainly afraid of the consequences of stirring controversy, while at the same time breaking the law. However, if my work were sponsored—and there were a legal framework in which it were seen by the public—I would happily do it again. We have to remember that this country was formed by a small delegation of men who knowingly committing treason against the crown in defense of what were the founding values of this nation. I believe the most honorable and patriotic thing to do, as a member of this society, is to continue fighting for those values. He doesn’t go into any detail, but it seems that he used commercial ad space without paying for it and perhaps covered up or removed the paid advertising which already was there. If so, he was stealing and that has nothing to do with artistic freedom.